10.40" x 7.20" x 0.60"
Cons: My only bummer: I was going to us a Rosewill tablet holder to keep it on a filing cabinet for easy retrival. The holder uses magnets to stick, and this Chromebook has magnetic sensing to see when the lid closes - which puts the unit to sleep. I was not able to find how to turn that off, and figured out another mounting method. Other Thoughts: I use this for quick web browsing and to stream Internet radio stations. The audio out is great! * can't "screw it up"
Other Thoughts: An excellent computer for beginners, seniors, or children – next-to-impossible to "screw it up". Good support for printers with Google Cloud Printing; automatic data backups with Google Drive Cloud Storage; good compatibility with files from Word + Excel + PowerPoint + PDF's + JPEG pictures + MP3 audio + MP4 video. 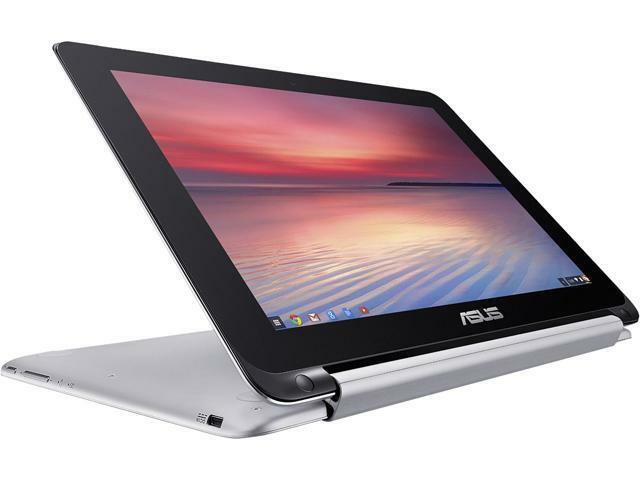 Be sure Chromebook has 4 GB of RAM, SD memory card slot, & HDMI output. Get an Intel Celeron 3205U CPU (Octane Benchmark of 15000). If you have lots of money, you could get an Intel i3 or m3 CPU (Octane Benchmark of 23000), or even an Intel i5 or m5 CPU (Octane Benchmark of 28500). As with any laptop, it helps to get an external 23" LED-backlit display to connect to HDMI port, for a much larger & useful display when at home. Can configure it to duplicate what is on Chromebook display, or to be a separate additional work space. You get 15 GB cloud storage with Google account, plus additional 100 GB cloud storage free for 2 years with Chromebook. After that, if want extra 100 GB, costs $2.79 per month (or 1000 GB for $13.99 per month). Also get about 9 GB of local storage for when not connected to Internet. For even more, add up to 1 TB on SD card, or multiple TB on external Hard Drive or Solid State Drive. If you are thinking of getting this as a gift for someone who will ask your assistance in using it, you will spend a lot less time helping them because it is so much simpler than Windows or Apple O.S.! All in all, a Chromebook is an excellent "first computer", or a good choice for an additional computer. OS will not be outdated several years later. Cons: The protective cover I bought doesn't all it to fold down completely. Other Thoughts: Having bought tablets before, I always ended up getting another tablet 2 to 3 years later, due to the OS being outdated. With an outdated OS, you are basically left with a brick. With a Chromebook, your OS will still be current several years later. No more tablets for me! This is basically a 2-in-1 laptop, since you can use it in tablet mode and in a traditional laptop configuration. The only "con" is that the protective cover I bought for it doesn't let the screen fold down completely flat in tablet mode. No fault to Asus. I can still use it as a tablet, since the keyboard still remains disabled in the tablet configuration. I just use the protective cover when I have to transport my Chromebook out of the house. Pros: built of aluminium. 360 degree hinge. small thin and lightweight. Fast enough processor. cheap. long battery life . Cons: large bezels on screen and the screen could be brighter. quiet speakers and no back lit keyboard. Other Thoughts: best computer for the price. if you want more performance and don't mind having a plastic computer look at the acer R11. if the display is first priority i would get the Toshiba Chromebook 2. Pros: Despite not being the most powerful chromebook on the market the weird processor manages to keep up very nicely. Screen is clear, sharp and bright. battery life is excellent. Metal body makes it feel much more premium than the other chromebooks around. Cons: Bezels are a bit large, speakers are tinny and quiet. Other Thoughts: Definitely go for the extra ram, it helps keep the chromebook from bogging down from too many tabs open. The touch screen is good and tablet mode is not impractical wihth chromeos. Having the extra display rotation is good for a small device. Be aware this is not a chromebook that you can put ubuntu on if you wanted to go there. Cons: Proprietary charger. Good luck trying to order a replacement or second charger from asus.com which is the only place it is available. After ordering a charger for $30, had to call in for 30 minutes to verify the order. Then got a call 3 hours later asking to verify the order again and wanting to jointly call the credit card issuer and have us disclose personal information like social security number for my credit card while they are on the phone. For an order for a $30 charger. Also had asus rep actually lie to us on the first call saying that the charger had already been shipped overnight when in fact it had not actually been shipped or even approved per the second call we got. Other Thoughts: I will be implementing a ban on purchasing anything under the ASUS brand name for my company after my recent experience dealing with ASUS. I have not had to do this with any company since the 90s. 3 out of 21 people found this review helpful. Did you? I apologize for your dissatisfaction with the quality of your recent customer service experience. This is not a normal reflection of how our company handles customer service. We do value our customers and take negative customer service experience very seriously. Please be informed that we continuously strive to improve our approach and processes in order to achieve customer service excellence. If you have issues, concern or questions regarding this recent incident, please email me at cl-rodel@asus.com. Pros: There are many things to like about his little gem. The flip ability is very handy and one of the main reasons I purchased this. Being able to use touch screen and keyboard together is great. It seems to have enough power to do all the basics including streaming video. Quick boot up and response time from opening up to operation. Ability to run linux is a big plus for me, as well. Cons: The only con I have come up with is poor bluetooth capability. When using bluetooth, I find the transmission is jumpy and the computer seems to slow down and gets hung up for several seconds. It is one drawback so far. Other Thoughts: All in all, this has been a very handy addition to for work and home. It is small and light enough to make it very easy and pleasant to carry and pop it open anytime very quickly. This is my first try with a Chromebook and I'm glad I jumped in. Pros: This is my second Chromebook, and I had a lot of trouble with a similar scale Windows device from the same mfg. But this is so much better, if you are willing to learn and don't need Windows apps. I do fairly complex photo editing, spread sheets, create and manage web sites on this. Great for travel. If you know what a Chromebook is. The build quality w.aluminum finish is so high that most who see it think it cost a cool grand. You can run a Windows PC from these using "remote desktop." Cons: Assuming you know what a Chromebook is, if all you need is a tablet and not a conventional keyboard, this is a bit heavy to hold for just reading books while skate boarding. Other Thoughts: Ask anyone who uses one, the absence of Windows or Safari are PROs, not CONs for Chromebooks.